No sign of weather improvement this Sunday for the third and final day of the round 3 of the WSK Final Cup. After wrapping up the morning’s Prefinals, the best remaining drivers in the four classes were ready for the final face-off on the Adria International Raceway. 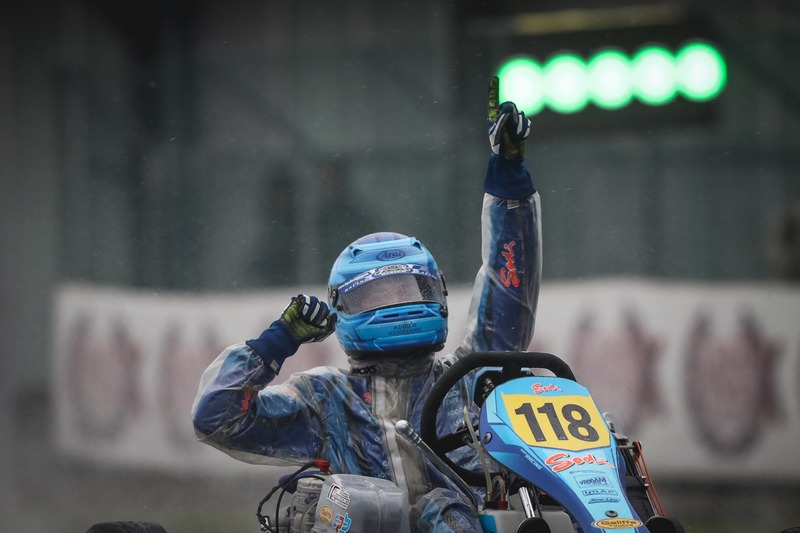 The Parolin chassis proved its efficiency in the storm by claiming three classes, OKJ with Gabriele Mini’, 60 Mini with Joel Bergstrom and OK with Andrea Rosso while Adrien Renaudin offered CPB Sport and Sodikart a dominant victory in KZ2, marking the conclusion of the WSK 2018 season. OKJ: Mini’ for the win, Barnard for the title! Winner in impressive fashion of the Prefinal B (8.7 seconds over James Wharton at the flag), Gabriele Mini’ (Parolin-TM) was granted with the final pole position of the weekend in the Junior class with Taylor Barnard by his side thanks to a similar performance in the Prefinal A. The first race to be disputed on Sunday afternoon, the Final saw the Parolin driver take his chances for the win as he built a 2.6-second gap over Kirill Smal (Tony Kart-Vortex) who clinched the second spot in front of James Wharton (FA Kart-Vortex). In the middle of a close pack in the latest stages of the 12-lap race, the Australian was able to keep Taylor Barnard (KR-Parilla) at bay. Andrea Kimi Antonelli (KR-Parilla) closed up the top-5 in front of Kai Askey (FA Kart-Vortex), Josep Marti (Tony Kart-Vortex), Nikita Bedrin (Tony Kart-Vortex) who lost four places from the start, Rafael Camara (Birel ART-TM), the Brazilian being penalized for incorrect positioning of his front fairing, and Conrad Laursen (FA Kart-Vortex). If he finally missed the podium for a mere four-tenths of a second, Taylor Barnard was nevertheless crowned victor of the 2018 WSK Final Cup – OKJ ahead of Gabriele Mini’, whose late win promoted him to second overall, and Kirill Smal, author of a strong weekend in Adria, both overtaking the missing Marcus Amand (KR-Parilla) in the final standings. Click here to find the OKJ Final results. Following a strong Saturday concluded with three Qualifying Heats in the bag, Lorenzo Travisanutto (KR-Parilla) kept the pressure high by adding the Prefinal A to the list, his 2.3-second advantage on Andrea Rosso (Parolin-TM) offering him the final pole position. Sadly, bad luck hit again at the worst moment when the Italian driver was forced to retire two laps from the chequered flag of what could have been a potential podium-finish behind Andrea Rosso. He wasn’t the only one with a bad karma as Nicklas Nielsen (Praga-Parilla) couldn’t even join the pack for the race due to a technical problem affecting his RS chassis. An opportunity that Rosso, absent of the firs two rounds, wouldn’t let slip away as he crossed the finish line just 1.1 seconds ahead of Kas Haverkort (CRG-TM) who came back from 6th on the grid to step on the podium. Both were joined by Leandro Anderruti (KR-Parilla). Dexter Patterson (KR-Parilla) turned a difficult starting position (12th) into a strong finish in fourth in front of Dilano Van’t Hoff (Exprit-TM) followed by Roman Stanek (Exprit-TM), Felix Arnold (KR-Parilla) from 17th on the grid, Noah Milell (Tony Kart-Vortex), Bence Kovacs Zsombor (Praga-Parilla) and France’s Sami Meguetounif (Exprit-Vortex) who went past 14 other drivers to edge the top ten. Despite the retirement, Travisanutto could savour his victory in this year’s Final Cup – OK in front of Haverkort and Anderruti, the Swiss driver completing the overall top-3 for one point over the unfortunate Nielsen and five over Patterson. Click hereto find the OK Final results. The 60 Mini Final was certainly no “walk in the park” for the 34 best youngsters confronted like their colleagues to very uneasy track conditions. Still, Prefinal B winner and pole-sitter Joel Bergstrom (Parolin-TM) put himself in control mode at the front, building a gap of 3.2 seconds on Kirill Kutskov (Parolin-TM). The Russian and Jamaïca’s Alex Powell (Energy Corse-TM), third, were both awarded with a podium-finish as Alexandr Tibekin (DR-TM), impressive in the Heats on Saturday, and his fellow countryman Alexander Gubenko (Parolin-TM) were faced with post-race time penalties for incorrect positioning of their front fairing. Ean Eyckmans (Parolin-TM) consequently finished in the fourth position ahead of Oleksander Bondarev (CRG-TM), Tibekin, Mikkel Pedersen (Parolin-TM), Rafael Modonese (Parolin-TM) and Rashid Al Dhaheri (Tony Kart-Vortex) who went through a difficult afternoon as he quickly dropped from second on the grid to 14th at some point in the Final before recovering the lost ground to finish 9th. A similar disastrous scenario hit Brando Badoer (Parolin-TM), third on the grid but only 16th eight laps later while Maksim Orlov (Parolin-TM) concluded his afternoon in the top ten. Two-times winner this year, Alex Powell could go home with the Final Cup title in the pocket, Ean Eyckmans finishing runner-up in front of Joel Bergstrom, Brando Badoer and Coskun Irfan (Parolin-TM). Click here to find the 60 Mini Final results. Despite some fierce opposition, the gearbox category would not resist to Adrien Renaudin’s impressive racecraft as the Frenchman went through Sunday’s rain in Adria in a very-dominant style. Winner of the Prefinal from pole, the CPB Sport representative made the best of his first spot on the grid to escape in the lead, helped in that matter by the tricky track conditions. With a gap between the leader and the field reaching up to 16 seconds, much of the fans’ attention was left on the battle for second place as Netherlands’ Dylan Davies (DR-Modena) defeated Jean Luyet (CRG-TM) for 0.4 seconds, himself chased (0.148 seconds!) by a fast-recovering Ariel Levi (Sodikart-TM) who started a further 8th on the grid. Jean Nomblot (Sodikart-TM) rallied the finish line in fifth while Emilien Denner (Kalikart-TM) got trapped in the midfield to finish 8th. The unlucky driver of the day was Axel Bengtsson (Kosmic-Vortex) who produced a brilliant effort to climb from 16th on the grid (due to a retirement in the Prefinal) to second at the chequered flag, before being handed a 3-second penalty for a wrongly-positioned front fairing, dropping him back to 6th. Renaudin, who didn’t take part in this year’s first race in Lonato, managed to add two victories to his tally to finally walk off with the Final Cup title in the KZ2 class. Despite this weekend’s less happy result, Emilien Denner concluded the competition in second ahead of Dylan Davies, Bas Lammers (Sodikart-TM) and Jean Luyet. Click here to find the KZ2 Final results. Find here the final results of the 2018 WSK Final Cup’s round 3 brought to you this weekend by WSK Promotion on the Adria International Raceway.